An extensive working vocabulary is a prerequisite for test-taking success on the Graduate Record Exam. This book presents 800 graduate-level words with definitions that frequently appear on the exam. Words are used in different contexts to familiarize test takers with their many variations. The book's additional features include a pre-test that helps to diagnose weaknesses, a lengthy word list with extensive practice exercises, and a chapter that discusses and analyzes essential word roots. The book concludes with a post-test to assess progress. Answers are provided for all exercises and for all questions in the pre- and post-test. This newly revised and updated manual presents a test overview, test-taking advice, and a timetable for a typical computer-based GRE test. Added features include: a diagnostic test with an answer key and answer explanations; a verbal reasoning review with practice questions in sentence completion and reading comprehension; an analytical writing review with scoring guidelines and practice exercises; a quantitative reasoning review that includes general math strategies, discrete quantitative questions, quantitative comparison questions, and data interpretation questions; two full-length model GRE tests with answer keys and answer explanations in the manual. Bonus Online Practice Tests: with purchase, students will also get access to two full-length online GRE exams with all questions answered and explained. These online tests are easily accessible on Macs, PCs, tablets, and smartphones. This set of flash cards tests students’ verbal and math skills and helps them to focus on areas that require additional study. The set consists of: 250 verbal cards, including definitions and sentence-completion practice; 250 math cards, including 75 math facts, 25 math strategies, 65 multiple-choice questions, and 65 quantitative-comparison questions, 10 multiple-answer questions, and 10 numeric-entry questions. Cards have a corner punch hole to accommodate a metal sorting ring enclosed with the set. Students can use the ring to arrange cards in any sequence that suits their study needs. 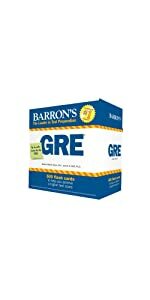 These flash cards can be used alone as study aids, or as a supplement to Barron’s GRE test preparation manuals. Those preparing to take the Graduate Record Exam will get plenty of hands-on test-taking practice with this thoroughly updated and revised book. Students will find: six full-length practice exams similar in length, structure, question types and degree of difficulty to the actual GRE exam; all questions answered and explained; extra features include a detailed overview of all of the different types of GRE questions and a series of tips and strategies to help test takers maximize their scores. 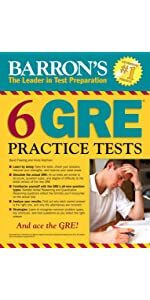 This book offers excellent test preparation when used alone, and also makes a fine companion when used along with Barron’s GRE, 22nd Edition. Prospective graduate students preparing for the GRE will find intensive and carefully focused preparation for the exam's verbal reasoning section in this book. The author discusses the purposes and structure of the question types, providing more than 380 example questions with explanations that demonstrate how to arrive at correct answers. Test takers will also find: a diagnostic test that allows students to pinpoint their strengths and weaknesses; extensive practice and review chapters that cover all three general question types ‒ sentence equivalence, text completion, and reading comprehension; two full-length verbal practice tests with answers and explanations; a concise GRE Dictionary ‒ a vocabulary list with definitions that all successful GRE test takers must master. This flash card set presents words and definitions that reflect the fluency and vocabulary skills of a college graduate. Each card lists a target word with pronunciation and part of speech. The card’s reverse side presents the word’s definition, a sample sentence, and synonyms. An enclosed metal ring lets test-takers select cards to fit their study needs. 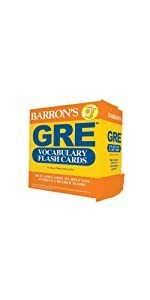 These flash cards can be used alone as study aids, or as a supplement to Barron’s GRE test preparation manuals. 5.0 out of 5 starsAll GRE takers should buy this. Now. And rush the shipping. I just finished taking the GRE last month - I had only 3 weeks to study because of an administrative glitch, so I needed a good resource and some quick shipping (thanks, Amazon). For my overall study guide, I picked Princeton Review based on previous use of their products and the overall positive reviews, and I was generally very pleased with it and its ability to help me work through the entire test prep matter in 3 weeks. That said, I could not have achieved my verbal score of 770 without this book from Barron's. I'm actually not sure I would have come closer than 700-720....it's that good. A reviewer for the Princeton Review general guide recommended this Barron book and I must second that review and all other five-star reviews here. The word list is EXTREMELY comprehensive and the exercises and 10-word unit breakdown really help you learn. I wound up going unit by unit. For each one, I'd read all the words and definitions and identify the ones I didn't know (or didn't "really" know...maybe I had a hunch but not a clear sense). For those unknown words, I wrote them down in a notebook, with a definition in my own words and a sentence I made up myself (Barron's also has sentences which will help you understand the word better but I think making up your own definitions and sentences and then writing them down helps it sink in). After working through all 80 units (whew) I turned to the notebook list of "trouble" words and basically quizzed myself and had others quiz me in multiple rounds, where in each round I highlighted the words I still didn't know, until that list got smaller and smaller and then disappeared. It was a lot to do in three weeks but Barron's really helped me focus. Seriously - get this book and you will maximize your score. For people like me whose verbal and essay scores are most important, this book is really worth the time it takes to work through. Get it! Get it now! Good luck, everyone! I bought this book because of its price. I've been holding it for a while. 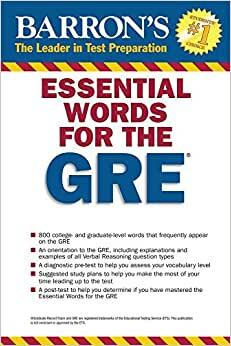 Since I worked through half of the book already, I wanna give some tips to the people who're using this GRE word book. The explanations are NOT very accurate. It seems like they've tried to cut the explanations shorter, and this is what causes the problem. In order to get the precise meaning of the words, READ ITS EXAMPLE SENTENCE. For example for the word "piquant", its actual meaning is appealingly SPICY instead of STIMULATING. You can see the real meaning by reading the example, which has clearly stated "spicy". Two Sentence Summary: This is the single best test prep book I have used since high school. I strongly recommend it to anybody preparing for the GRE. 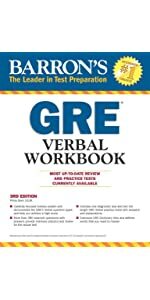 This book helped me prepare for the GRE and expand on my academic/professional vocabulary. Words in this book, especially the ones marked with an asterisk (*) appeared on practice tests and my real GRE. These works have also been helpful in my graduate school work and professional career. I still keep this book in my office and reference it regularly. However, the book is only effective if you have enough time to move through the lessons methodically. It was very helpful to make a concerted effort to think in and use the words. Otherwise, I found that I quickly forgot them. The author makes a good effort at grouping words that have related meanings or etymology in the same sentence. For example, asperity and aspersion are in the same lesson. These words have similar meanings, but are different parts of speech. Grouping them helped reinforce the etymology and prevent confusing them. Due to the time it took to move through sections, if you have fewer than three months or so to prepare this book might not be the best use of your time. In this case something more direct, such as Barron's GRE, 21st Edition would probably be more worthwhile. Otherwise I recommend it to GRE test takers or any graduate students. I originally bought this book to get ready for another exam that has verbal ability section. I thought it was amazing that it divides the words in units of 10 words, and you then get to practice those words with exercises.. I also noticed that I've started using these words in my daily life, which proves that it is a good book (for me at least, i'm horrible with memorizing, I typically understand and rarely memorize and learning new words has always been a challenge for me since english is my third language). 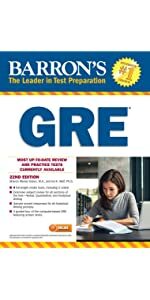 I would definitely recommend it for those non-english speaking people, and you can always get it and use it to set a baseline, then get more advanced GRE books to benefit as much as you can. When I was studying for the GREs, I became a crazy person. It is difficult to improve your verbal score, so I knew that I needed an extra study aid to memorize the necessary vocabulary words. I decided to purchase this book in particular because of the great reviews. Needless to say, the reviews were accurate and the book was amazing!! I would go through a chapter and make an index card for each word that I did not recognize. I used colored index cards (green for positive words, red for negative, etc.) and on the back I divided it into four squares (short definition, synonyms, antonyms, and an illustration of the word...it sounds crazy but it worked!). The end of each chapter included several exercises for the new terms (matching, true/false, and filling in the blanks). I found this extremely helpful; it was engaging and stimulating, which is important when you are studying mundane vocabulary terms. I completed the entire book and managed to memorize the unfamiliar words. I believe that my success on the verbal section of the GREs (I managed to get a 162!) are due, in part, to the activities and words found in this book. As a poor college student, the price of this book was AWESOME. That along with the fact that it was super helpful makes it a great purchase!